An inexpensive and indispensable toy! They're soft but tough and our parrots love to chew/peel/shred these for hours. Extra-thick cardboard design that's a great diversion for feather-pickers or just to get YOU a minute of "quiet time!" Use these to dress up old toys (string over chains on existing toys to help the old seem new again). 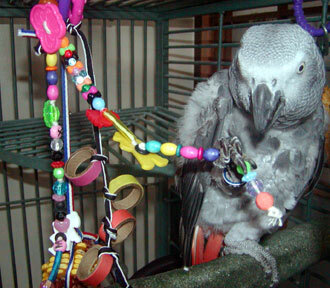 If you use your imagination, it'll help enrich the time your birds have to stay in their cage or just give them something extra to do to keep busy! Note: If your bird loves bagels, be sure to try the bites! We are now offering a sampler package that includes of 2 ea of 3/4", 2", 3", 1-3/4" chunky and 1-1/5" short bite. Note: There's nothing that says you have to use bagels as a foot toy. DYHA, Zachary on far left and CAG, Wolfy in the middle have their bagels "hung" in the cage to be enjoyed whenever the mood strikes them.